In fact, the Georgetown Raiders right winger, who is 5-foot-7 and weighs 160 pounds, now has to be considered the favourite to win the OJHL scoring crown. Jacome entered the week sharing top spot in the scoring race with Wellington Dukes forward Brayden Stortz. Both players had racked up 89 points apiece so far this season. Stortz and the Dukes have just one regular season match remaining, at home Friday versus the Whitby Fury. Jacome, however, has two games left to add to his total. The Raiders will hit the road and square off against the host Burlington Cougars on Friday. And if he does not earn more points than Stortz does on Friday, then Jacome will have the luxury of knowing exactly what he has to do on Saturday in the Raiders’ final regular season contest, at home against the Mississauga Chargers. 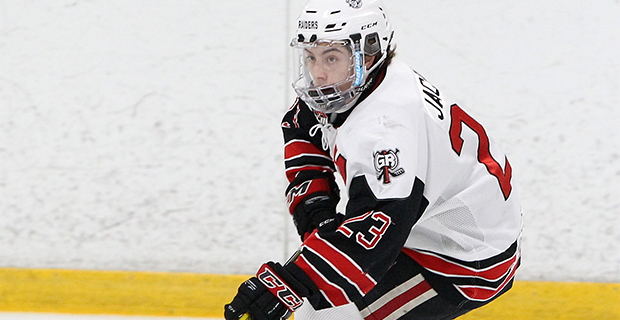 Jacome said winning the OJHL scoring title would be a huge accomplishment for him. Jacome’s trophy case already includes some OJHL hardware. A year ago, he was named the league’s top rookie after accumulating 67 points, including 23 goals, in 54 regular season matches. Representatives of the Clarkson Golden Knights were impressed enough with Jacome’s skills and offered him a full Division 1 scholarship last February. He’ll be joining the New York-based university squad starting with the 2018-19 season. But not everything has gone Jacome’s way this season. He admits he was rather disappointed not to be included in a pair of Canadian Junior Hockey League showcase events. For starters, he didn’t even receive an invitation to attend the training camp for the Canada East squad that participated at the World Junior A Challenge in December in Bonnyville, Alta. And Jacome was also not one of the 40 players chosen to compete in the CJHL Prospects Game, staged in Cornwall in late January. Jacome said he’s not certain whether decision makers for those squads were turned off by his small stature. Jacome prefers to focus on things he can control to some extent. For the immediate future, he’ll focus on helping his squad win its final two regular season contests and in the process, perhaps win the league’s scoring title himself. And then he’d love to help the Raiders, considered one of the postseason favourites, capture the OJHL championship.